Go to your Google Calendar (http://www.google.com/calendar/a/lehigh.edu). 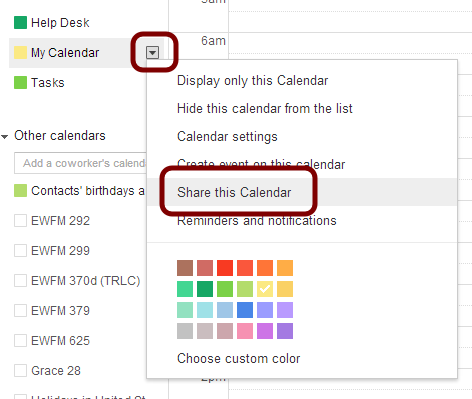 In your calendar list on the left side of the page, click the down-arrow button next to a calendar, then select Share this calendar. Under the Share with specific people section, enter the email address of the person you want to share your calendar with then press enter, click on their name if it comes up, or click the Add Person button on the right. Make changes AND manage sharing: This person will have owner rights to your calendar. You cannot grant someone outside the Lehigh domain this level of access to your primary calendar. Make changes to events: This person can see and change your events, including private events. You cannot grant someone outside the Lehigh domain this level of access to your primary calendar. Click save. Once you click Save, the person(s) you selected to share the calendar with will receive an email invitation to view your calendar. They will need to click on the link contained in the email to add the calendar to his/her Other calendars list, the calendar will not be automatically added to the user’s Calendar account.